I dropped a part of my clutch off at Brakes and Equipment last week and got the call that it was done so I stopped over and got it. Here are a couple of photos of the driving plate Part# 11578 in the diagram below that has been redone and a spare that I have. When I dropped it off, there was much explaining involved but they were up for it. They said it would take longer than their usual 24-48 hours because they hadn't ever seen a clutch so small. There was a finished clutch for a tugboat! on the table ready to be shipped back out. The fiber plates on the clutch are a bit wider than the original but it won't affect the working of the clutch. 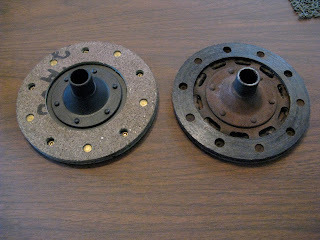 The fiber plate thickness is the same for the old and new driving plate so it should work well. Al in the shop showed me how he had to cut the material on two different machines to before he could get the size to use. It sounded like an involved process that took a few tries, but they got it right. And more important were very reasonably priced. Thanks guys. I will be going back there for the brake lines and redoing the brake cylinders when I get to that point. The weirdest coincidences happened there. 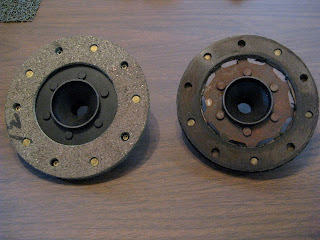 After never hearing of a Vespa 400, someone mailed Brakes and Equipment their brake cylinders to find parts to rebuild them today. What are the chances that they would be working on parts for 2 Vespa 400's in the same week. I don't know the person, but saw their name and look forward to meeting them on the road!